Today I'm playing with the adorable Christmas Cookie Cutter Bundle again! These little reindeer are just too cute!! 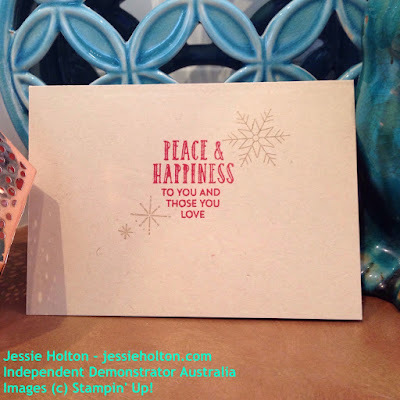 These are similar to the cards I made the other day, but I just love this quick & easy design. It really shows off the gorgeous Candy Cane Lane Designer Series Paper! I have started with a Crumb Cake cardstock base & a layer of the Candy Cane Lane Designer Series Paper. Next, I have stamped the reindeer onto Whisper White cardstock in Crumb Cake & the sentiment in Real Red. I have cut out the reindeer with the matching Cookie Cutter Punch & the sentiment with the Decorative Label Punch. Then I have used Tombow Multipurpose Glue to stick them to the card, slightly overlapping the reindeer & added a bit of the Gold Baker's Twine from the Trio Pack. I've wrapped this all the way around the card twice, so you can see it when you open the card, too. 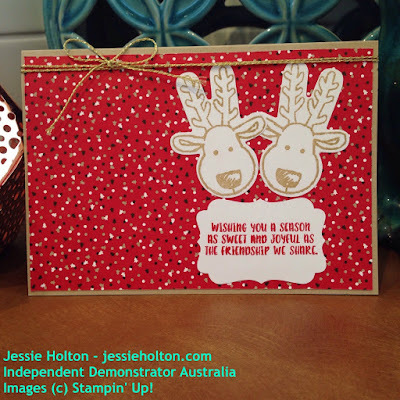 I have used the sentiment & snowflakes from the Stitched with Cheer stamp set in Real Red & Crumb Cake. You can line up the snowflakes where you want them & then pick them all up on one large Clear Block so that you only have to ink & stamp once per card, if you're doing a bunch the same. 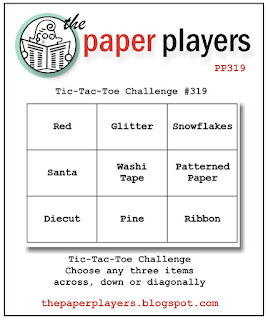 I have entered this card into the Paper Players Tic Tac Toe Challenge this week. I have chosen the top line with Red, Glitter & Snowflakes.